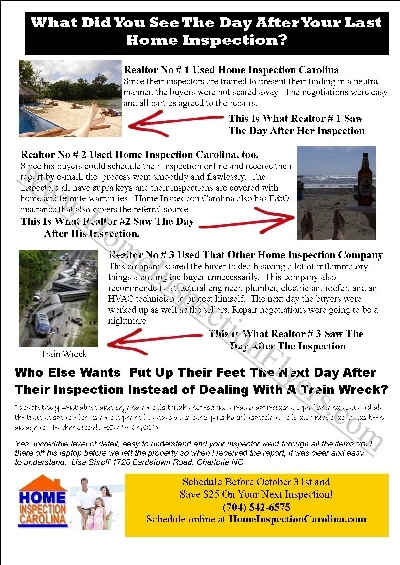 Hi, Preston Sandlin here, owner of Home Inspection Carolina in Charlotte, North Carolina (http://www.homeinspectioncarolina.com). I was once a struggling one man firm having a hard time keeping my schedule full, I did what EVERY OTHER HOME INPSPECTOR DID. I had flyers and cards made and went around to the offices and passed them out. I got marginal results; I was just another shell on a beach full of home inspectors. It dawned on me that if I wanted to fill my schedule I was going to have to be a pearl among all those shells. SO WHAT I DID I DO TO AVOID EXTINCTION??? I started studying some of the most successful copy ads and copy writers of all time and by this I mean some ad copy that has been proven to sell. 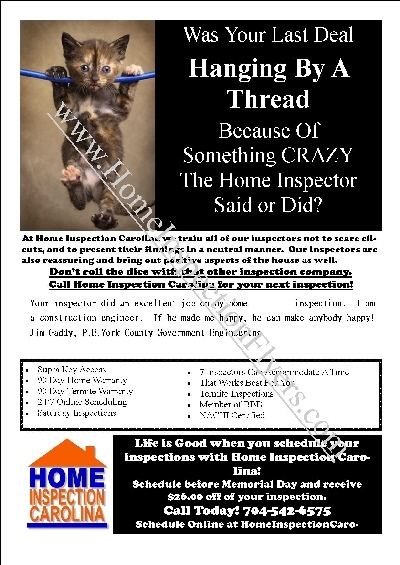 I became a home inspection copywriter. While we are talking what’s in it for you, WHAT IS IN IT FOR YOU???? One Flyer could easily be valued at $30. If a home inspector’s time on average is worth $100 per hour, you would have to be able to create a flyer in under 20 minutes for it to be worth your time. If a $30 flyer led to only one sale you would receive at least a 10-fold return on your investment. At a value of $30 each, then 5 flyers a month is worth $150. By becoming a member of our site, you will receive 5 Flyers for only $29.99. This is less than the price of ONE FLYER – and you are getting FIVE! Now, once you are a member, you will also be able to buy additional flyers for only $10. This is 2/3 off or a savings of almost 70% which is an additional benefit of being a member. Note the flyers come as swipe files in Microsoft Publisher, and all you will need to do is replace the contact information, logos, and testimonials with your own. If you want us to put in your testimonials, information, and logos you will need to email us that information and we will perform that service for an additional $5.99 per flyer. We process orders through Paypal. Your account will be debited monthly for your subscription.